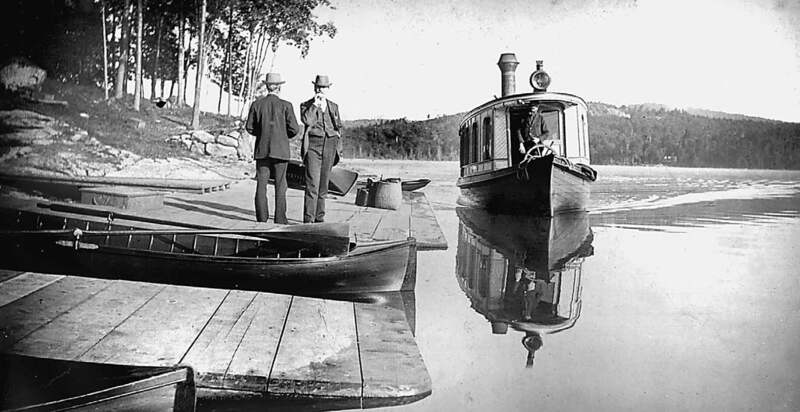 The steamboat Fulton on Fourth Lake, 1891. Old pictures fascinate us. They jumpstart memories among our elders and prompt younger viewers to wonder, “What was it like back then?” Pictures tell stories, and if we peer between the pixels, those of us who were not there can deduce something of what it was like “back then”— what people did for work and fun, how they designed their infrastructure, how they related to each other, even how photography was done. Hold the pictures up against today, and we can see how people have changed, how the land has changed, and how the relationship of people to the land has also changed. Capitalizing on this fascination, Arcadia Publishing of Portsmouth, N.H., has carved out a successful niche for itself by publishing collections of photos from the late 19th and early to middle 20th centuries. Honing in on local history, the company in 1994 launched its Images of America series, each volume full of vintage black-and-white photographs celebrating the history of a town or region. The Adirondacks provides a rich source for such images. Among pertinent titles with varying thematic approaches in the series are Adirondack Lakes, by Thomas A. 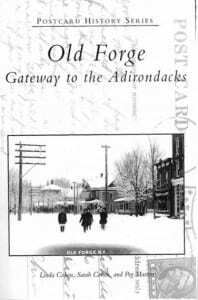 Gates; Along the Adirondack Trail and The Adirondacks: 1931- 1990, both by Donald R. Williams; Cranberry Lake and Wanakena, by Susan Thomas Smeby; and Old Forge: Gateway to the Adirondacks, by Linda Cohen, Sarah Cohen and Peg Masters. Gates’s book, with its regionwide field of vision and larger format, is $26.99; the others are all $19.99. Gates is a collector who has contributed to other such compilations and organized exhibits of antique Adirondack photography. Williams is an author, columnist and storyteller; his Adirondack Trail volume takes us north along Route 30 as it bisects the entire Adirondack Park. Smeby is a co-founder of the Wanakena Historical Society and a longtime postcard collector. Linda and Sarah Cohen are the granddaughters of Moses Cohen, founder of the renowned Old Forge Hardware store, while town of Webb Historian Peg Masters is a descendant of an early logger in the area. 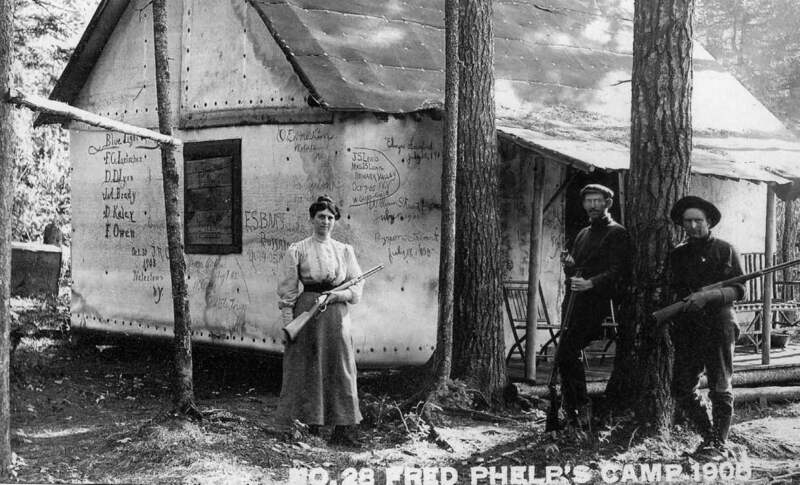 Fred Phelps, center, poses in 1908 with two companions outside his hunting cabin near Cranberry Lake. Between the covers of these engrossing books one can find the work of such noted photographers as Seneca Ray Stoddard, Katherine McClellan and Henry Beach, as well as that of the lesser-knowns and the amateurs. Many of the images were once postcards from the pre-World War I era, that genre’s heyday. Each book also contains a short introduction and informative captions. But it is what the pictures tacitly tell us about the ways of life in the mountains that is most compelling. 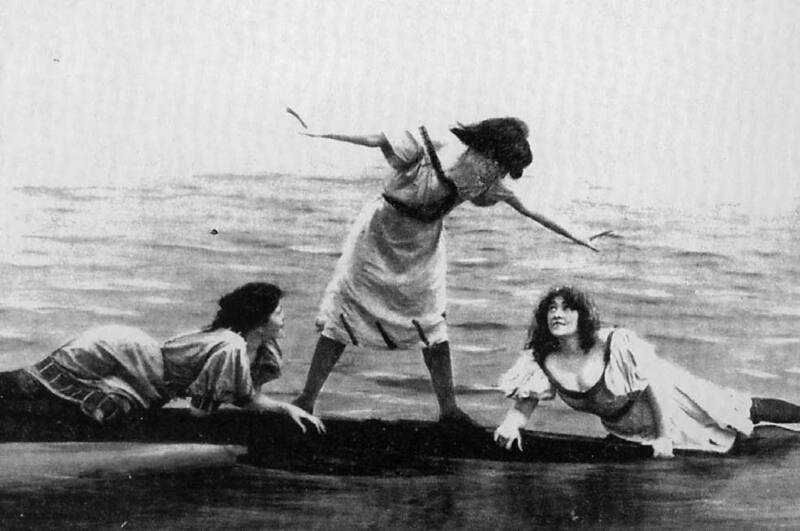 People turn up in the vast majority of these pictures, although less so in the two volumes by Williams. Stoddard’s well-known “In the Adirondacks” of 1889 graces the cover of Adirondack Lakes: a guideboat floats on a placid pond in the Saranac Lakes region, a prototypical guide is ready at the oars, his client relaxes in his seat, a trophy buck lies on the bottom, and two dogs, fatigued from hounding the deer, loll wherever they can find a spot. For a hunter, could life look any better? 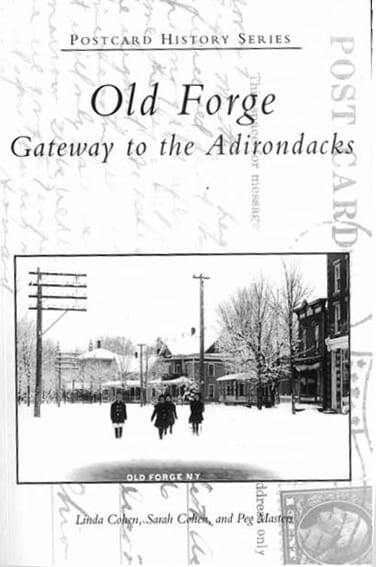 Old Forge’s cover portrays four children in a snowy street scene of a century ago, while Cranberry Lake presents a view of a throng of people boarding one of the tiny steamboats that once plied the lake. Within one sees the many manifestations of humankind that made the Adirondack population the unique amalgam that it became. There’s a family decked out in its Sunday finery and stuffed into a Model T, country music combos, hunting parties, log drivers hop-scotching across a jam, proud hikers and smug hotel guests. The frontispiece to The Adirondacks: 1931-1990 shows the operators of L.L. Buyce & Sons General Store in Wells sometime in the early 20th century and reveals that small-town retailers of that era were not concerned with merchandise display—every available square inch is packed with hunting boots, chewing tobacco, canned goods, knives and every other necessity imaginable, in no logical arrangement whatsoever. Hauling logs near Old Forge, 1914. “People at work” could be the headline over many of these pictures. 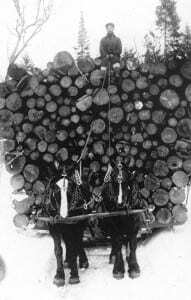 Knee-deep in snow, two burly loggers in plaid shirts and high boots with pant legs stuffed inside their wool socks attack a log with a monster crosscut saw in front of a lumber-camp kitchen. 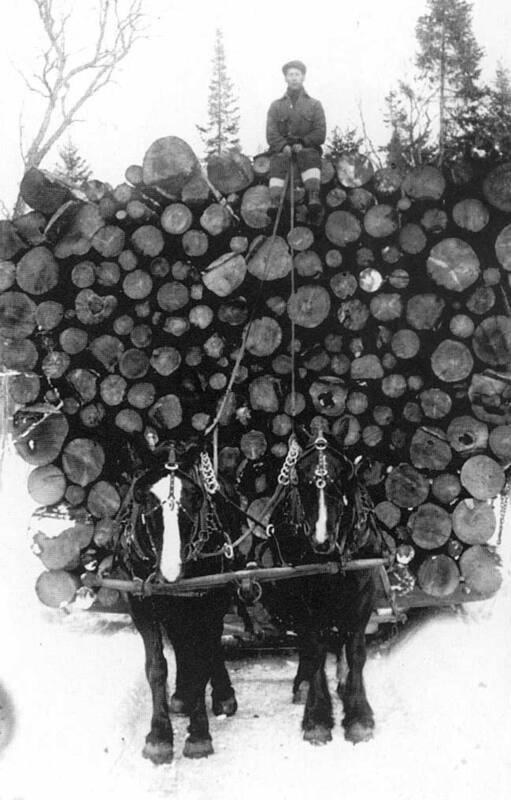 In another shot, a crew stands atop 65,000 pounds of saw logs being hauled out of the woods on an ice road by a two-horse team. A straw-hatted farmer sells potatoes out of the back of his pickup truck, while another farmer’s wife churns butter outdoors, managing a rare smile for the camera. Professional spruce-gum picker Elmer Patterson of Lake Pleasant poses in formal wear for a 19th-century portrait. Walt Weaver of Northville delivers freight by horse and sleigh for the Fonda, Johnstown & Gloversville Railroad. Cat Mountain fire tower observer John Janack stands in the door of his cabin in 1914; a weary-looking teacher stands in the doorway of the tidy Star Lake schoolhouse a year earlier. This was a time when $10 a week was decent pay, leaving early on Friday was unheard of, and there were no OSHA regulations. 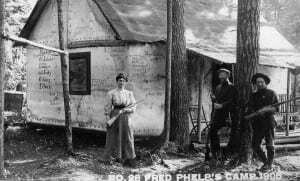 The places where people carried on their lives get their fair share of attention too—churches, fairgrounds grandstands, boat liveries, sawmills, Great Camps and hunting camps. A quick perusal of these books proves that the Adirondacks were once festooned with hotels—big, sprawling, wooden ones, most of which ultimately burned. In an era when “summer vacation” meant an extended stay at one of these establishments, with long days of fishing, boating and lounging on the veranda rather than a mad dash from one cookie-cutter motel to another, with hurried stops at crowded tourist traps, the hotels became a cornerstone of the Adirondack economy as the extractive industries began their steady decline. Scenes such as “Osbourne Inn, Speculator, New York” in Adirondack Lakes demonstrate that while the architectural style may have been rustic, the lifestyle was anything but. Another building that symbolizes a different and departed way of life in the Adirondacks is the train depot. At one time, dozens of them stood in all but the most remote recesses of the mountains as railroads knit the expansive region together like never before. Now, most of the railroads are gone. But they turn up constantly in these books. “Log Train at the Plains” in Cranberry Lake and Wanakena is stark evidence that places we now call “wilderness,” with its implications of permanence, were not always so. Four scenes of stations in Old Forge show that the depots had their own architectural imprint; the crowds in each scene show how vital the rails were in the days before good roads. One of the most poignant images in all of these books is that of a solitary, forlorn-looking Sunday school teacher waiting for a train at a tiny, spartan depot half-buried in snow. 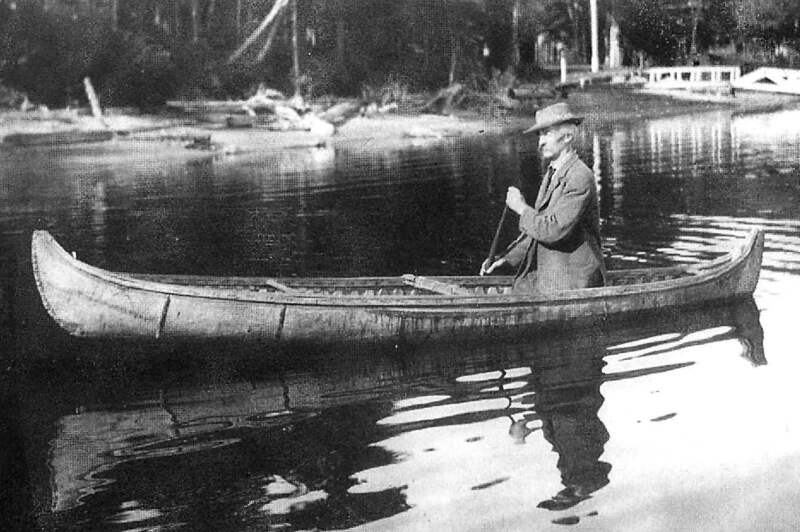 Paddler believed to be J. Henry Rushton, renowned canoe builder.